I was (not so) recently contacted about trying a product called Puppy Treads, which are meant to help with slipping on smooth surfaces. I don't have a puppy, but this sounded great because I had been concerned lately about how much Jacque seems to slip on the vinyl flooring in our house. For some reason it's just him and not Pippen! So I jumped at the chance to test them out (I was given these for free, but these are my own opinions). They sent a bunch! I really started thinking about where I was going to put them. What would be the most helpful areas. I decided that it would be good to start with transition from carpet to vinyl. 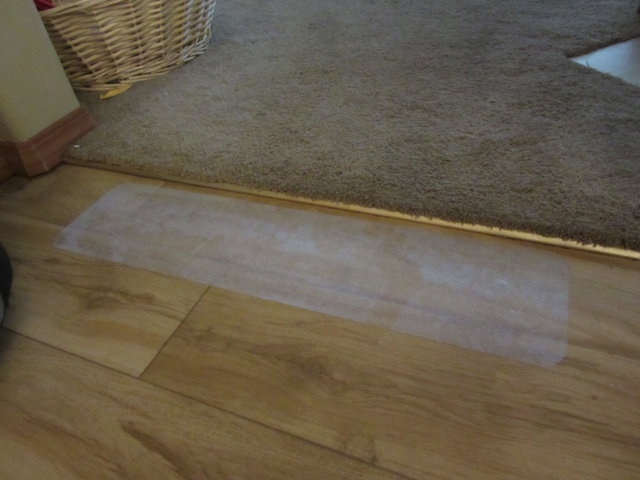 I put one of the puppy treads on the vinyl right after the carpet ends like in the picture below. I think they've been really helpful so far! I have a bunch more to use and think I will add one more right behind these ones to help a little more. They're really easy to use. Just peel the backing off and smooth onto a clean surface. The instructions that came with them were short and sweet! These would be really great for stairs. Here's some good info about Puppy Treads. You can try them too and save 10% with code BLOG2014. WHY do I need Puppy Treads? WHERE can Puppy-Treads be used?